A new study by researchers from NYU School of Medicine reveals, what we already know, that there is a zone of tissue known as the interstitium that is composed of layers of interconnected, fluid-filled compartments, below the skin’s surface, which surrounds musculature, vessels, and nerves, and lines the digestive tract, lungs, and urinary system. 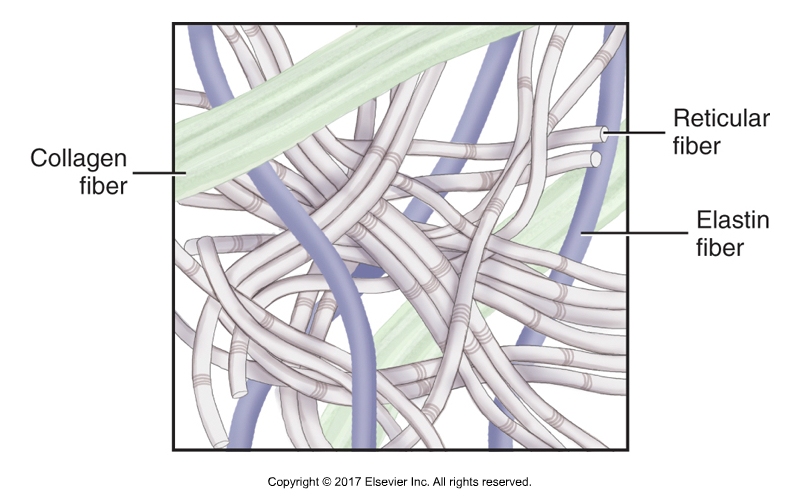 The interstitium is composed of a meshwork of strong collagen and flexible elastin connective tissue protein fibers. As such, it may act like a shock absorber that keeps tissues from tearing as visceral organs, muscles, and vessels squeeze, contract, pump, and pulse. Interstitium fibers. Permission Joseph E. Muscolino. Kinesiology – The Skeletal System and Muscle Function, 3ed (Elsevier, 2017). While this “discovery” of this “previously unrecognized” interstitium from the medical world has recently attracted a lot of media hype and attention, it has already been very well recognized in the world of manual therapy. 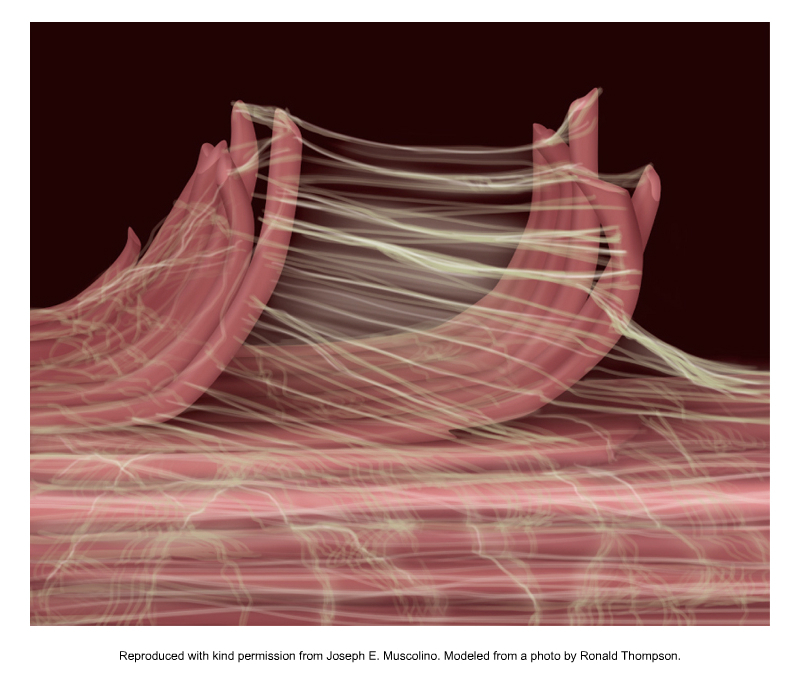 Gil Hedley demonstrated this quite a few years ago and called it the Fuzz; more recently he has termed it perifascia. Jean-Claude Guimberteau also has shown this network in his endoscopic study Strolling under the Skin, which he called the Multimicrovacuolar Collagenic Absorbing System, MVACS, a network of collagen fibrils forming microvacuoles that appeared to be randomly organized but can adapt itself to various stress forces. Deane Juhan’s book, Job’s Body similarly has described the qualities of the fascial connective system interstitium. And the Stecco Family out of Italy has researched and published numerous articles on the subcutaneous fascial interstitium. Then there is all the wonderful work of Robert Schleip, Thomas Findley, and so many others. And all manual therapists who perform skin-rolling techniques recognize the importance of the subcutaneous fascial interstitium. Indeed, any massage therapist who has been in practice for a few months/years or longer can easily feel and palpate changes in the fibrous fascial aspect of this “newly discovered” interstitium. Fascial fibers of peri- and endomysium. Permission Joseph E. Muscolino. Modeled on a photo by Ronald Thompson. Kinesiology – The Skeletal System and Muscle Function, 3ed (Elsevier, 2017). It is ironic that this very article that is showing recognition of the soft tissues of the body, reveals its ignorance of any research that has already been published about that very soft tissue. By describing it as “previously unrecognized,” this demonstrates the long-standing bias against soft tissues by the Western World of Medicine. This is bittersweet. We manual and movement therapists should be happy and view as sweet that tissues that we long recognized as being important are finally beginning to be recognized as such. Yet it is a bitter pill to swallow that these researchers seemed to think that they just discovered something new that we have been researching, writing about, and working with, for decades! Pardon my historical political analogy, but it reminds me of Cristoforo Colombo (his real name folks, Christopher Columbus is his “anglicised name” – the fact that most of us know his name anglicized also shows a bias, doesn’t it?) “discovering” the “new world” when there were already tens of millions of people there who felt like this world had already been “discovered” by them thousands of years before and was not “new” to them at all! This new study finding is based on a newer technology called probe-based confocal laser endomicroscopy, which combines the slender camera-toting probe or an endoscope equipped with a laser that lights up tissues, and sensors that analyze the reflected fluorescent patterns. It offers a microscopic view of living tissues. The researchers found this interstitial system during their study of bile ducts from twelve cancer surgeries through the endo-microscope. The team then realized that this new space occurs throughout the body, wherever tissues are moved or compressed by force. The cells lining the space (fibroblastic cells), are most likely responsible for creating the supporting collagen bundles around them. The cells may also be mesenchymal stem cells, which are known to be capable of contributing to the formation of scar tissue seen in inflammatory diseases. Lastly, the protein bundles seen in the space are likely to generate electrical current as they bend with the movements of visceral organs and muscles (perhaps similar to the already recognized tissue response known as the piezo-electric effect) and may play a role in techniques like acupuncture, said the authors. 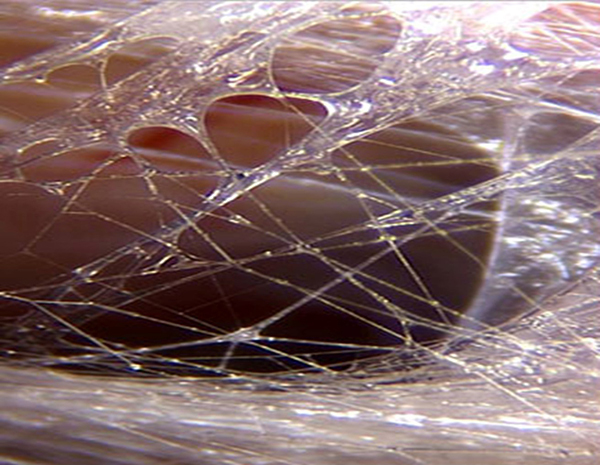 Fascial interstitium – fluid gel-like ground substance. Permission Joseph E. Muscolino. Kinesiology – The Skeletal System and Muscle Function, 3ed (Elsevier, 2017). The authors further speculated that the finding that the interstitium acts like a highway, capable of moving fluid throughout the body, might explain why cancer that invades the interstitium becomes much more likely to spread (metastasize). The human body is approximately 60% water; approximately two-thirds of that water is found inside cells, but the other one-third is “interstitial” fluid. Draining into the lymphatic system, the newfound network is the source of lymph, the fluid vital to the functioning of immune cells that generate inflammation and antibodies. Furthermore, the cells that reside in the space, and collagen bundles they line, change with age and may contribute to the wrinkling of skin, the stiffening of limbs, and the progression of fibrotic, sclerotic and inflammatory diseases. As mentioned in a note above, any manual / massage therapist who has some palpation experience, can feel the qualitative difference between the soft homogenous fluid-like texture of a baby or young person’s subcutaneous interstitium, and the more fibrous (“cheese-clothy”, “chicken wiry”) texture of the same interstitium as fibrous collagen is laid down within it as a response to strengthen and reinforce the tissue in response to the physical forces that are transmitted through the interstitium with use and aging. In effect, this qualitative change in interstitial tissue texture is caused by a quantitative change in the laying down of tough collagen fibrous tissue within the otherwise soft fluidy gel-like interstitium. 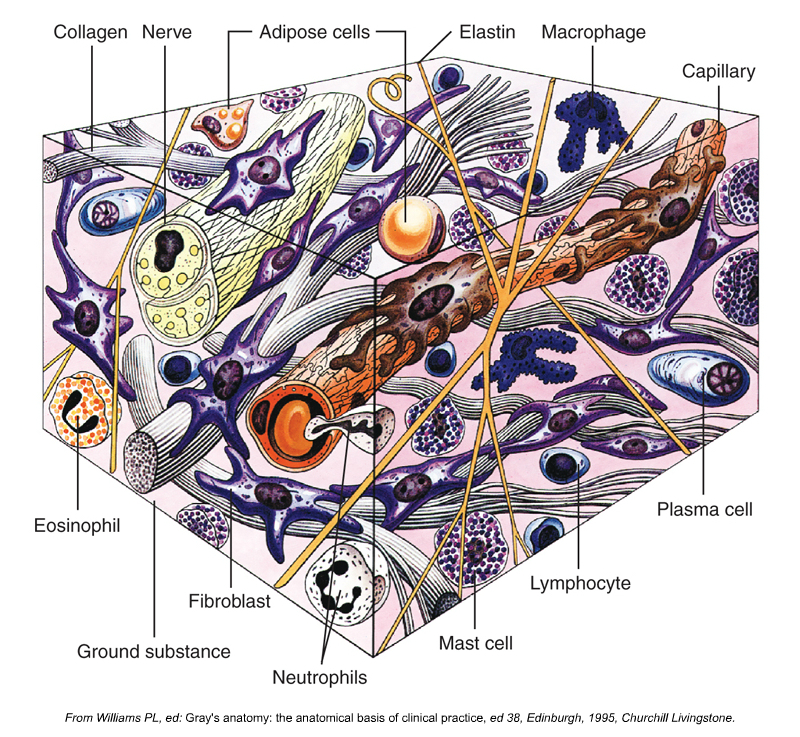 The Interstitium as an Organ? The authors described this network interstitium as an organ in its own right, which has created a new excitement regarding fascia. However, many fascia researchers are frustrated that there are already many studies on the connective tissue system that have been discussed in length at the Fascia Research Congresses, which were entirely ignored by this study. Of course, the good news is that the fascial connective tissue system is now becoming even more widely recognized. This article was created in collaboration with www.terrarosa.com.au.